The global population is growing and aging so rapidly that this has become one of the major short-term healthcare challenges. According to a United Nations report, the number of people aged 80 or over is expected to reach 909 million by 2100, which is nearly seven times the number in 2017. What can we learn from the experiences of countries with leading healthcare systems that are now investing massively in the digitalization of processes to meet increasing demand? According to World Health Organization statistics, as of 2016, 70% of EU Member States had a national eHealth strategy and 84% of Member States had national universal health coverage. To fully implement eHealth programs, European countries need to overcome the financial barriers, and for many governments, it has become a priority to improve the way how health data is collected and explored. The Nordic region is a pioneer in the digital transformation of healthcare. Finland’s government has implemented a number of projects including electronic health records (EHR) system, an e-prescription service, virtual hospitals, and online eHealth services. The Finnish Ministry of Social Affairs and Health considers eHealth services to be a win-win for people and the government. Digitalization is a must in order to improve the level of care, accessibility, and cost-effectiveness of Finnish social and healthcare services. Finland will host an HIMSS & Health 2.0 European Conference in Helsinki in June 2019 to bring together the best knowledge and expertise and get insights from industry leaders into healthcare digitalization. Another country at the forefront of eHealth is Austria, with its ELGA — an information system that networks all health information and makes it available digitally for all patients, doctors, and other healthcare professionals. The National Health Service in the United Kingdom has started implementing artificial intelligence (AI) in early diagnosis, innovation, prevention, and treatment in order to compile data about successful treatments and disease progression. Analysis of the healthcare sector in Germany shows that the digitalization of processes could potentially result in €34.0 billion in savings in 2018. The study by McKinsey identifies 26 digital money-saving trends, which are divided into six groups of solutions. The total estimated savings are in part based on efficiency improvements and reduction in demand for services. Demand is projected to decrease due to improvements in treatment quality, such as by avoiding duplicate examinations, preventing hospital admissions, and minimizing subsequent treatments. Inpatient hospital care (EUR 16.1 billion) and outpatient general practitioner and specialist care (EUR 6.5 billion and EUR 8.6 billion) are supposed to to be the spheres with the most potential for savings. 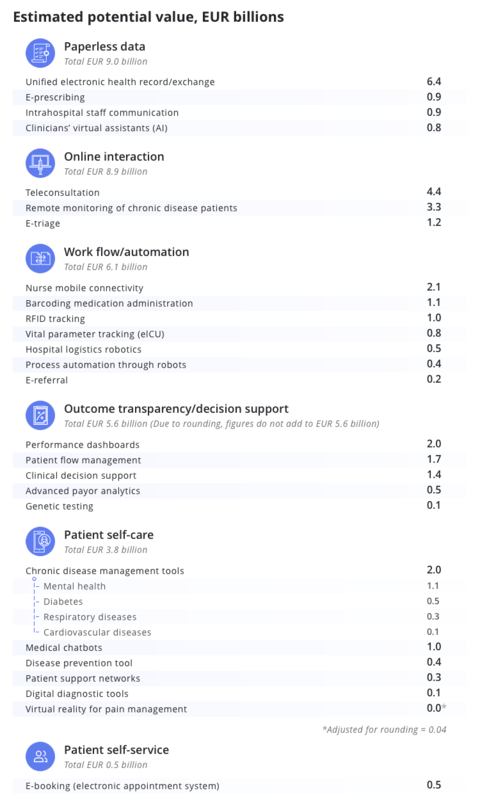 The greatest savings are expected from implementing digital data and online interactions (EUR 9.0 billion and EUR 8.9 billion), followed by workflow/automation and outcome transparency (EUR 6.1 billion and EUR 5.6 billion). Patient self-treatment and patient self-care provide only around 13% of the potential value. However, patient involvement is of great importance when it comes to improving healthcare systems. The Netherlands, with its high-level science and good opportunities for startups, also takes one of the leading roles as a healthcare innovator. The Dutch government encourages eHealth services and has taken a number of actions to make eHealth more available by supporting startups and monitoring the progress of digital developments in the healthcare sector. The number of people aged 100 in the Netherlands is expected to double by 2031, which is why Dutch hospitals are doing their best to speed up in adapting technologies. One Dutch medical group is preparing to meet this increasing demand. The VieCuri Medical Center is a top clinical teaching hospital (STZ) covering 280,000 citizens in the southern part of the country. VieCuri employs more than 3,000 staff and has 450 hospital beds. The current focus of the hospital is fulfilling the Digital Regional Vision, which aims to provide faster and more efficient healthcare services through digitalization. Thus allowing VieCuri to offer more specialized services to the patients in the region. To accomplish this goal, departments must manage their capacity effectively to respond to the flow of project requests from the hospital. As is clearly shown in the analysis of Germany that we mentioned above, the path to digital transformation requires implementing numerous projects in parallel and this has a huge impact on resource capacity. So in order to succeed in digitalization, the ICT department in VieCuri uses a multi-project management software solution called Epicflow – a web-based project management tool aimed at helping clients meet strategic goals. Since 2017, Epicflow has been marked by IT managers as especially helpful in making accurate capacity projections. It has become a valuable addition to VieCuri’s project management system because it creates connectivity with all projects in the portfolio and exposes the gaps MS Project has in capacity management in a multi-project environment. The biggest feature that sets Epicflow apart from other project management solutions is it’s what-if algorithm, which calculates how many additional projects the portfolio will be able to undertake without overloading the business’s available capacities. The What-if analysis also provides the project managers with the opportunity to take preventive measures and avoid bottlenecks. Using Epicflow, VieCuri’s management is now able to manage more projects simultaneously with the existing resources. This will expedite the digital medical services more quickly and allow VieCuri to provide the best patient care to the increasing population of Limburg. Making better resource allocation decisions, forecasting backlogs, and hiring the required number of people give healthcare organizations the opportunity to provide good care to a constantly increasing number of people. Successful management of multiple projects in such a complex industry as healthcare is the key to meeting rapidly growing demand. Book a live demonstration of Epicflow and discover how to keep your healthcare business up-to-date financially and technologically. For a global overview of the future of healthcare, read the book Healthcare Systems: Future Predictions for Global Care, which contains success stories from 60 countries. You can also watch the talks from the Web Summit 2018 HealthCare stage to hear about the latest healthcare trends.